The best way to get to know a community is by scheduling a tour. See the facilities, meet the staff and residents, and get a feel first hand what it's like to live at Benchmark Senior Living at Woburn Assisted Living. When seniors join Benchmark Senior Living at Woburn, they are able to connect with brand-new friends, their passion and nature because our community has all these perks and more. We offer all the privacy and convenience of a home with the peace of mind that comes from having staff on site ready to lend a helping hand whenever it's needed. We are conveniently located off the Northern Expressway and just minutes away from the Woburn Mall and other entertainment options. 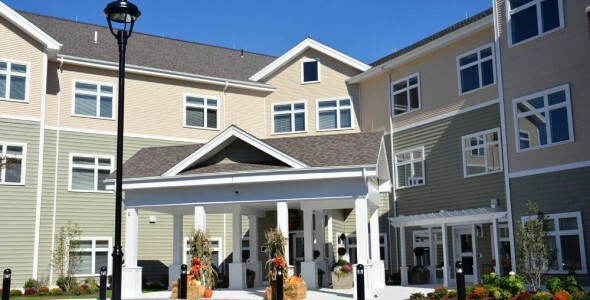 Benchmark Senior Living at Woburn is a Benchmark Senior Living community. As our name implies, we are committed to setting standards of excellence in senior housing. At Benchmark, it is our mission to provide world-class amenities, innovative programs and personalized services. make his/her own. Modern finishes, such as kitchenettes and baths with granite countertops, give each apartment a luxurious feel. And family members are thrilled with the safety features available in each home, and the peace of mind those features provide. For the enjoyment of our residents, Benchmark Senior Living at Woburn boasts a number of community areas which include a salon with spa services, a fitness room, an activities room and a country kitchen. To fill each day we offer a robust activity program that has more than 150 scheduled activities, such as gardening, book discussion, art workshops and volunteering opportunities. All residences at Benchmark Senior Living at Woburn are provided with weekly housekeeping and linen services, allowing your loved one to spend more time to enjoy themselves and less time dealing with the hassle of home maintenance. Area transportation is also provided and is an easy way for our residents to reach personal appointments and run errands. Your loved one also has access to a number of other helpful services 24 hours a day. Each of our seniors receive a personalized service plan, so that the level of care provided always meets their individual needs and preferences. Such services may include help with medication management, dressing, personal hygiene and other activities of daily living. Through our award-winning Live No, Live Engaged memory care program, we also care for residents with Alzheimer's or dementia. Come discover what sets Benchmark Senior Living at Woburn apart from other retirement communities in the area!